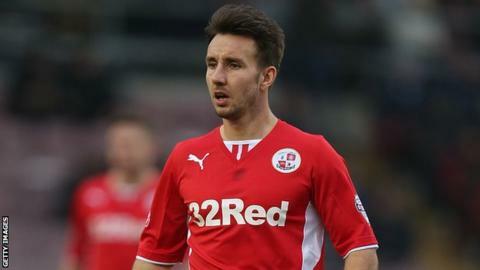 Goals from Matt Tubbs and Gwion Edwards sealed victory for Crawley and heaped more pressure on Tranmere Rovers. The results means Rovers remain only three points above the League One relegation zone with four games left. The visitors had chances but Matthew Pennington's header and Max Power's shot were kept out by Paul Jones before Tubbs curled in a free-kick. Jake Cassidy was denied by Jones when one on one before Edwards sealed it, poking past keeper Owain Fon Williams. "Too many players were poor in the first half, without naming names. The performance levels need to improve if we're going to get anything from games. "We've created our own problems by giving the ball away too easily and by the ball not sticking. There were a lot of needless mistakes that we need to improve on. "Overall, we've probably had the better opportunities. In the second half we looked a lot better and looked like we could score at any time, but you leave yourself vulnerable late in the game." Match ends, Crawley Town 2, Tranmere Rovers 0. Second Half ends, Crawley Town 2, Tranmere Rovers 0. James Rowe (Tranmere Rovers) is shown the yellow card. James Rowe (Tranmere Rovers) has gone down, but that's a dive. Ian Goodison (Tranmere Rovers) wins a free kick in the attacking half. Matthew Sadler (Crawley Town) is shown the yellow card. Jamie Proctor (Crawley Town) hits the right post with a right footed shot from outside the box. Attempt missed. Jamie Proctor (Crawley Town) left footed shot from outside the box misses to the right. Corner, Crawley Town. Conceded by Ian Goodison. Goal! Crawley Town 2, Tranmere Rovers 0. Gwion Edwards (Crawley Town) right footed shot from outside the box to the bottom right corner. Assisted by Gary Dicker. Attempt saved. Jean-Louis Akpa-Akpro (Tranmere Rovers) header from the centre of the box is saved in the top centre of the goal. Substitution, Crawley Town. Gary Dicker replaces Josh Simpson. Substitution, Tranmere Rovers. James Rowe replaces Jake Kirby. Attempt missed. Cole Stockton (Tranmere Rovers) header from the right side of the six yard box is close, but misses to the right. Jake Kirby (Tranmere Rovers) wins a free kick in the defensive half. Substitution, Crawley Town. Gwion Edwards replaces Andy Drury. Substitution, Tranmere Rovers. Cole Stockton replaces Junior Brown. Junior Brown (Tranmere Rovers) wins a free kick on the left wing. Attempt missed. Max Power (Tranmere Rovers) right footed shot from outside the box misses to the right. Paul Jones (Crawley Town) is shown the yellow card. Attempt saved. Jake Cassidy (Tranmere Rovers) right footed shot from a difficult angle on the right is saved in the centre of the goal. Attempt missed. Jamie Proctor (Crawley Town) right footed shot from outside the box misses to the left. Substitution, Crawley Town. Sergio Torres replaces Matt Tubbs. Corner, Tranmere Rovers. Conceded by Michael Jones. Attempt blocked. Jean-Louis Akpa-Akpro (Tranmere Rovers) right footed shot from the right side of the box is blocked. Corner, Tranmere Rovers. Conceded by Mark Connolly. Corner, Tranmere Rovers. Conceded by Paul Jones. Attempt saved. Jake Cassidy (Tranmere Rovers) left footed shot from the centre of the box is saved in the centre of the goal.